Crypto market investors are generally a serious lot, and I can’t say I blame them. After all, I’m one of them, and the bear market in mid-2018 has resulted in mainstream media coverage that is less than flattering, despite the still-relatively-small market capitalization of digital assets as a whole. If you were like me, in late 2017 you probably took pride in relating how incredible a crypto investment was to friends and relatives, and now in July of 2018 you’re having to defend it against legitimized skepticism. While doubts about the utility of some of the high-profile digital assets like Bitcoin and Ethereum might be grounded in fact, XRP’s value is tied to real-world business use cases. It can be frustrating for XRP owners to listen to mainstream media – and crypto news outlets – get the facts wrong. Is there something that we can do to help the situation? There’s a multitude of ways that we as XRP owners can help it gain more mind-share in the realm of both crypto-and-mainstream media. What started out as an idea has now taken hold of the imagination of a large group of writers within the XRP ecosystem. The XRP Community Blog has now hosted dozens of new and existing writers that have previously blogged about XRP and Ripple on their own individual sites; and some are using the platform to publish guest blogs as well. To support this initiative, I’ve shut down my own individual blogging site, and have started blogging exclusively at the new community blog site. June 7th was when I made the transition, and it’s been a run-away journey ever since, with dozens of new authors joining the community blog. Now, between the time I release my own blog, there are normally between five-to-ten blogs that are released by other community authors. The creativity and originality in some of the blogs is amazing. Note that on Twitter you won’t be able to send a direct message unless the person also follows you, so you may need to contact me or the other individuals on another platform if you are not a frequent Twitter user. The XRP Community Blog site has some rules for authors – and their content. Some writers don’t like to be constrained in their creativity, even peripherally. If you wish to contribute to the XRP blog-o-sphere, but want to do it on your own site, that’s great too. A dissenting opinion doesn’t always mean bad news; it can sometimes prompt us to think ‘out of the box’ in certain situations, or to question an established narrative that may not fit the facts. The important thing is that you know that your contribution, even if potentially controversial, is still a valuable addition to the overall choices for reading; it just may not fit into the rules established for the Community Blogging site. A lot of crypto fans like video. Some people are actually what psychologists call ‘kinetic learners’ where motion is a benefit to quicker learning and apprehension. While I’m not one of these, and I prefer the written word to video, I respect the massive audience that some YouTubers command on their channels. Most of the list above was one I appropriated from a Reddit post by /u/604WeekendWarrior; While I’ve taken the time to preview the channels I was previously unfamiliar with, I don’t specifically endorse any of the views contained in those channels, or the recommendations that they might provide. With that caveat communicated, I’ll reiterate that YouTube provides an incredible medium for efficient transmission of perspectives and views in a very compelling manner; the XRP YouTube space has much room for more respected “vloggers” (video bloggers), so hopefully we’ll start to see even more video content as 2018 progresses. Developers are the wizards who create applications built on the XRP Ledger or its ecosystem components such as ILP and Codius. If you look at what the current set of XRP Community members and companies have created , it’s a long list comprised of XRP veterans who have been following both crypto and XRP for years, and newer developers to the XRP space that have recently taken an interest in Codius hosting or XRP Ledger application development. While it involves smaller, nominal amounts of XRP, it’s an example of what a viral application could do for the XRP Ledger if done on a larger scale. The potential here is enormous and cannot be overstated. In many ways the development space for applications on the XRP Ledger is a greenfield environment – an empty canvas – where developers now have the tools to construct their own viral applications. They could be mobile apps, or even a popular game created by an enterprising developer; the community has shown an appetite for these new creations. The list of developers I know is quite lengthy, but for fear of missing any notable devs, I’ll forgo a name-by-name list of contributors in the XRP space for now; I tend to cover their individual creations on a blog-by-blog basis; if you read my previous blog you’ll come across a few names that have taken steps to contribute code libraries, step-by-step guides, and those who are also Codius hosts. Over the years, there have been some very memorable promotions and games sponsored by the XRP Community. The example that always springs to my mind are the various meme contests. If you look at recent examples, contests and promotions can also be a great way of solving challenges for the community as well; The most contemporary example of this concept is the design for the XRP Symbol. For years, the Ripple triskelion had been linked to XRP, but that needed to change. To accomplish this, the community held a contest for design submissions and then held a vote for the best submission. While it may not have been a perfect process, it serves to show that a contest or promotion can overcome potentially-divisive issues, and result in a cohesive direction where the entire community can move forward. In terms of general promotion of XRP, another example is @mercury’s coin promotion on XRPChat. 2 The first one was so popular that he started his own external site 3 to help users get bullion coins. He’s also held fund-raising raffles 4 on XRPChat. These are examples of what one individual can do using the resources available to help the community. The XRP Community may not have the same level of resources as Ripple when it comes to donating XRP, but we can do a greater variety of activities with our own creativity. I’ll give you an example: @KingBlue (Twitter handle) realized when he was using the XRP Tip Bot that it could potentially be used to give small amounts to charity. The XRP Tip Bot has a feature where it automatically creates an account for any valid Twitter account if a donation is given. In other words, even if a charity is not registered at the Tip Bot site, if it has a valid Twitter account, you can tip that charity! The charitable organization then must determine how to address the balance, otherwise sell it or trade it, and collect the money. In most cases, I suspect that the charities involved will likely leave the balance until some future date when the amounts reach material levels that demand action. This could happen because of the raw number of donations, the appreciation of XRP, or potentially both. In any case, this was only one example of how charitable contributions can be used to promote XRP at the same time, and also provide a positive outlet for crypto investors to give back to the community. I like the concept of guerrilla marketing, and I’ve spoken about the profound effect that some of these ideas can have on the public perception of cryptocurrency – and XRP. Whether it’s bumper stickers, XRP t-shirts, or even customized license plates, these individual marketing efforts can result in substantial word-of-mouth publicity, also known as ‘water cooler talk’ in offices. Speaking of which: Do you work in an office? 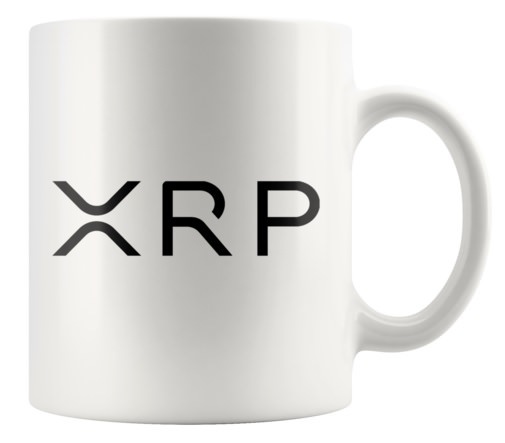 How about an XRP mug to start some conversations? If you’re interested in wearing some XRP memorabilia, keep in mind that the community is trying to promote the new XRP symbol instead of the old Ripple triskelion. For my own part, I have to order some new t-shirts seeing as how my old ones are now collector’s items! There are many more swag shops in the crypto space, but the last five in the above list are owned by XRP Community members. There are others owned by XRP fans as well; if you’re looking for swag, there's definitely more than one online store to choose from. We are still at the early stages of adoption of XRP – both for institutional use by banks, and by appreciation of its value by the current crypto market. The composition of the crypto market is slowly changing to include more traditional investors that prefer proven track records and utility-driven value for a digital asset; this bodes very well for XRP, but it doesn’t mean that we can rest easy. To counter this, it’s not enough to depend on the companies that are using XRP. While it’s great that Ripple, Coil, Omni, and others are using XRP, they are not enough to 'get the word out.' As a community, it’s important that we also do our part to promote the adoption of XRP; we can do so in a variety of ways. Whether your contribution is passive (wearing XRP t-shirts?) or active (Making YouTube videos? ), know that you are doing your part to help promote the next generation of international commerce. Imagination and creativity is on our side, and we’ve seen multiple examples of what one individual can do to elevate XRP in the public’s mind.